Oakley has retrieved its original manufacturing tool they used in the early 80s to give this collection a change to enter the brand history. 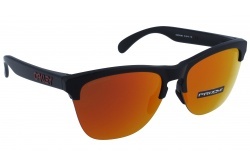 That was the moment when sports brand Oakley designed a unique sunglass collection under the name of Frogskins. Made from O Matter, one of the purest materials that’s used nowadays in frame manufacturing process. It enhances clarity and impact resistance, and at the same time, it blocks 100% of all UVA, UVB, UVC and harmful blue light up to 400nm. This UV filter is not a coating added to the lens surface, but le lens comes with it directly from the lens lab. High Definition Optics (HDO) is a set of patented technologies that allow Oakley sunglasses to meet and even exceed the testing standards of the American National Standards Institute for optical clarity, visual fidelity and impact-resistance. Thanks to decades of innovation, Oakley performance glasses offer perfect protection against high mass and high velocity through impact protection technology. Protection is a benefit of first quality materials and unique engineering of lens and frame combinations by Oakley. Eye conditions that come directly from UV light includes cataracts, pterygium or macular degeneration. 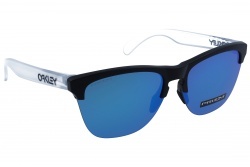 Oakley Frogskins protection comes precisely from the very lens material, which is available in different Iridium shades. A three-point fit system is a patented innovation that ensures that each frame makes contact only at the bridge of the nose and behind the temples. This retains optics in perfect alignment and eliminates the discomfort of ordinary frames that hook the ears and mount with unbalanced pressure points. 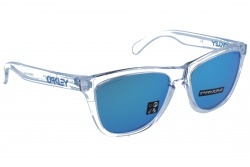 Get now your Oakley Frogskins in an easy and safe way and at the best price at Optical H.